The life of a fashion model seems impossibly glamorous, endless gorgeous clothes, runways and catwalks and camera flashes popping left right and centre as you go about your job. Models and modelling was present in Hull from the early days, as far back as the 1920s and 1930s. In fact it is only since the 1970s that live models in small fashion shows stopped being seen in the city, up until then it was one of the main ways to advertise clothes. In the 1930s Hull was full of shops and department stores; little ones lining the streets and big ones like Hammonds , Thornton Varley, Bladon’s, Costello’s, Willis’s, Edwin Davis and Carmichaels. Each were owned by families local to the area, names of chains we think of today rarely found in pre-war Hull. Women visited their hallowed halls popping into the city to find the perfect bag, that desirable dress and those essential silk stockings. Usually they went by foot by bus and train, sometimes by car. Edwin Davis department store stands on Bond Street rebuilt after being blitzed in WW II. 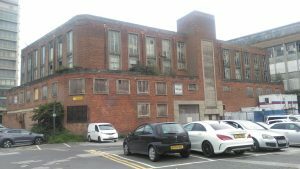 Derelict, the Art Deco building is earmarked for demolition to make way for a new shopping complex called Albion Square. Image © Carrie Henderson. The character of shopping areas before World War II was set out until Luftwaffe planes took many, in the 1950s rebuilding turning it into the city people walk round today. It was an occasion to go shopping; restaurants in each of the big stores like Hammonds and Thornton Varley were packed and mannequins – as models were known – walked around diners wearing clothes from the women’s departments to tempt them into making a sale. Owner of the House of Mirelle, Mira grew up in Hull. 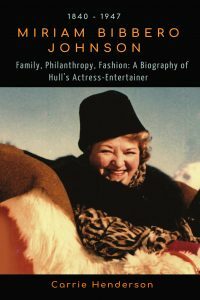 A famous actress, in her biography you can see photos of and read about her growing interest in clothes. You can read more on page 63, along with lots of other juicy info. about Hull’s fashion history in the rest of its pages. By June 1949, Berketex the national brand had a concession at Thornton Varley. Photographic models who looked similar and stood in the same way were employed for their newspaper and magazine campaigns. Way back then models were often local girls. The Hull Daily Mail on 5th October 1946 printed an article about model miss Jean Lodge. She made the pages of the local newspaper because she was in a fashion display at the Royal Albert Hall by the Guild of British Creative Designers. It was the first time she modelled, picked from 200 girls. She lived at Fairfield Avenue, Kirkella and went to Beverley High School. Leaving a year and a half before outbreak of war she was employed as secretary to a company director and was very surprised to be selected, thinking she was too tall for the work. Like Jean Lodge models are traditionally tall and slender. In the days of live mannequin displays good deportment and the ability to move in the way that displayed clothes properly was dictated by the expectations of fashion display at the time. 1940s model Seignon was a famous model whose bookings included Christian Dior. Watching her in action she and the rest of the women moved in the same way, flowing with grace and calm that you can also see on the Linda Leigh catwalk. But by the end of Hull’s modelling years things had changed. Fashion was more experimental than in the 1940s and 1950s, in 1977 extremes introduced by Punk. Parisian fashion was no longer the authority on the world’s stage and although still tall and slender, women could do their own thing as they had more creativity and flair walking the variety of fashionable clothes. 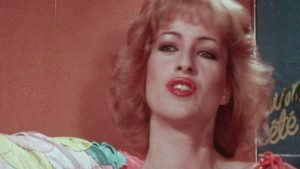 BBC TV’s The Models shows Sarah Grant being expressive and innovative, the industry in 1978 very different than the one Jean Lodge joined in 1946. Cherry Marshall saw the biggest change. Selected by Seignon in the 1940s she established the London Model House Group soon after and ran a hugely successful business for many years. Models then had a shelf-life, youth being crucial but these days women of all ages, body shapes and sizes are employed as models representative of the range of real women buying fashion today. 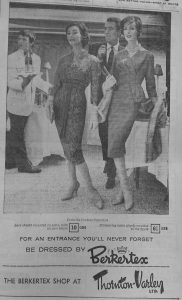 50 + ladies were still showing clothes in live fashion shows in Hull in the 1970s. With white hair and a mature body shape they were included as much as those younger, seen in photos with those in their 20s, 30s and 40s alongside. Fashionable clothes are not limited by age. Sarah Grant shows how models do the job today. Hull’s stores knew that older women had purchasing power and liked clothes as much as teenagers, it was cutting edge in that way. What happened to Sarah Grant? Look how great she is modelling fashions of today.